BOSTON – Story-telling has changed markedly when it comes to drawing young people into a film or a live stage play. In an era of ever-more-amazing video games and 3-D movies with special effects, getting them to sit still in a theater demands a potent combination of magic and adventure. Fortunately, it’s all there in the ArtsEmerson and Ma-Yi Theatre presentation of “The Wong Kids in the Secret of the Space Chupacabra Go!” at the Paramount Theatre through March 6. Violet (Sasha Diamond) and Bruce (Alton Alburo) are two suburban types, with 13-year-old Violet heavily involved in the daily drama of middle school and trying to fit in, while younger brother Bruce, 11, is caught up in a life revolving around comic books and science fiction. Violet urges Bruce to put away his toys and stop being so nerdy, but Bruce is fixated on a pile of rocks he is determined to move simply by willing it. “Eureka!” It turns out he has such a power – they both do., and they can teleport themselves telepathically, useful for getting around in a crunch – and there are many crunches in this 90-minute production. Enter the kids’ alien neighbors Mars (Jon Hoche) and Mr. Stinson (Matthew Gunn Park), who inform the kids that a creature called Space Chupacabra – think an intergalactic Pac Man — is busily swallowing planets in the galaxy and has its voracious eyes on Earth, and if the Wong kids don’t step up to the plate and stop it, well, you know. 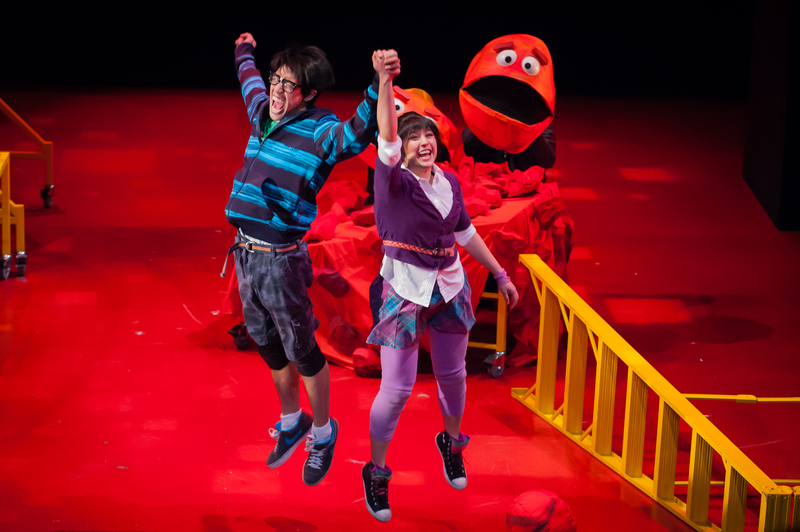 “The Wong Kids” benefits greatly from some well-done stagecraft in the area of sound, lighting and music, using some ingenious puppets and just enough humor to get by. Hoche portrays three of the eclectic collection of characters Violet and Bruce encounter, including Mars, the has-been superhero who advises Violet and Bruce on how best to save the world. He also teaches Violet and Bruce how to breathe in outer space without a mask and later also inhabits the child-eating creature Bandersnatch and, later, Qweeguin, a quite remarkable singing dragon,whom Hoche maneuvers and takes right up into the audience to meet some of the theater-goers. David Valentine’s ingenious puppets are the actual co-stars with the humans., including The Grand Prognosticator (Matthew Gunn Park) a re-imagined sage right out of the TV series “King Fu” and Master Kan. There is a lovely scene where Kate Marley plays Nobody, Violet’s alter-ego and insecure self who has a debate with Violet over her self-worth. Violet must decide whether her life might be better if she conformed to the norm, instead of being who she is. The topic of bullying is also front and center – in “The Wong Kids” it turns out that while the kids have experience on the receiving end of bullying, the villains have also been bullied at some point, possibly playing a role in their joining the dark side. That especially goes for the Imperious Canute (George West Carruth), the power behind the evil Space Chupacabra. It doesn’t hurt to reinforce positive messages, but sometimes the message threatens to obscure the magic, always dangerous when it comes to kids with short attention spans. But fear not. Soon after the public service messages, “The Wong Kids” will stop bickering and return to the intergalactic adventure and crazy creatures that should hold the interests of adults and children alike. The ArtsEmerson and Ma-Yi Theatre presentation of “The Wong Kids in the Secret of the Space Chupacabra Go!” Play by Lloyd Suh. Directed by Ralph B. Pena. At the Paramount Theatre through March 6. artsemerson.org.